This 2-centre holiday staying in Lancashire and Dumfries, includes the fabulous journey on one of Englands most scenic railway lines, the spectacular Drumlanrig Castle and gardens and the lovely seaside town of Southport. Sunday  We depart Wiltshire in our luxury coach and make our way to the Ribble Valley and our first hotel in Leyland. Comfort stops on-route. We have included tea and coffee on arrival while your cases are taken to your rooms. Time to settle in before dinner. Monday  A day in Southport today and an opportunity to relax on one of Southports sandy beaches, boasting amazing views of the Lancashire coastline. You may wish to ride the Tram on Southports Victorian pier, the second longest in the country, or explore the quaint and interesting shops and tea-rooms with their Victorian canopies, the choice is yours! Tuesday  We leave Leyland and travel to Settle for a morning departure on the famous Settle to Carlisle Railway. 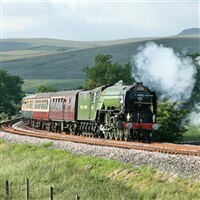 This journey of 72 miles of unspoilt countryside, arguable the most scenic of any English railways as you pass through 14 tunnels and over 20 viaducts including the Ribblehead viaduct which has 24 arches and stands 104 feet above the moor. We will arrive in Carlisle for free time over lunchtime before continuing to our second hotel in Dumfries, with tea and coffee on arrival. NB Please note this is Not a steam train. Wednesday  After a leisurely breakfast we visit Drumlanrig Castle known as The Pink Palace a fine example of late 17th century Renaissance architecture constructed from pink sandstone. We include a guided tour before a visit to the castle tea rooms where a scrumptious early afternoon tea will be served. This afternoon you will have free time to explore the 40 acres of beautiful castle gardens. Thursday  After breakfast we depart our hotel and begin our journey back to Wiltshire. Comfort stops on-route. Both hotels have en-suite bedrooms with hospitality trays, TV, hairdryer and leisure facilities. The hotel in Leyland does not have a lift, but ground floor bedrooms are available on request.